Teacup Shih Tzu - Do You Know About This Tiny Hybrid? You are here: Home / Breeds / Pure / Teacup Shih Tzu – Do You Know About This Tiny Hybrid? Teacup Shih Tzu – Do You Know About This Tiny Hybrid? With their flowing hair and small size, the Shih Tzu is one of the most recognizable dog breeds. They are known for their calm, loving nature and unique appearance. Their small size and low exercise requirements make them particularly suited to apartment living. Despite the Shih Tzu’s already tiny size, there have been some whisperings of a teacup Shih Tzu. But does this incredibly small dog breed really exist? And what makes them different from a full-sized Shih Tzu? To introduce you to this tiny dog, let’s look at an in-depth overview of where this breed comes from and how they differ from other Shih Tzus. Though the Shih Tzu is already quite small itself, there are many reasons why someone might want an even smaller version of this dog. Firstly, the smaller the dog, the less space it takes up. Even though the Shih Tzu is small already, if you live in a tiny apartment, every pound counts. Smaller dogs take up less room on the couch, require less room to run around, and don’t need colossal equipment and toys. If you’re strapped for room but want a dog, it is usually a good idea to adopt a smaller one. Secondly, smaller dogs are far more transportable than larger dogs. Do you envision yourself taking your pooch on shopping expeditions? Then a smaller dog is probably going to be your best bet. While smaller dogs are usually not suited to hiking or long walks, they are very fitting for a shopping trip. Thirdly, smaller dogs usually require less exercise and maintenance than larger dogs. They have shorter legs, and therefore don’t have to walk as far for a moderate amount of activity. Their smaller stature also means that they have less hair to brush. While a Shih Tzu does require regular grooming, they are easier to take care of than a larger, long-haired dog. Lastly, many people just find smaller dogs cuter than larger dogs. They tend to look like puppies for longer and initiate our natural caring instincts. No matter what reason you might want a smaller dog, it is crucial to educate yourself before you rush out and adopt one completely. Not all small dogs are the same. And things tend to get more complicated when breeders attempt to create smaller versions of certain dog breeds. Where Do Teacup Shih Tzus Come From? There are three main ways breeders create miniature versions of dogs. Each method has its difficulty and drawbacks. One of the most common ways is to mix the breed with a smaller breed. Since mixed breed dogs inherit traits from both parents, this can lead to puppies that appear to be mini-versions of larger breeds. Another way breeders create teacup-sized dogs is by introducing the gene for dwarfism. This method is mostly based on luck and produces dogs with unproportionally short-legs. The final method involved repeatedly breeding runts. Smaller dogs usually produce more miniature puppies. So, it only makes sense that breeding runts together would create smaller-than-average dogs. This method might seem fool-proof, but like the others, it also has its drawbacks. Let’s look at each method in turn. This method is one of the easiest and most common ways of creating a teacup Shih Tzu. When you breed two dogs together, they inherit traits from both parents. If you breed a Shih Tzu with a smaller dog, there is a possibility that it will be smaller than an average Shih Tzu. However, this is in no way guaranteed. You never know which traits a puppy is going to inherit from which parent. Odds are, the puppy will inherit a mix of traits from both parent breeds. It will likely not look or act entirely like a Shih Tzu. And its size can range quite a bit depending on the parent breeds. Mixing the Shih Tzu with a smaller breed will most likely not result in a mini version of a Shih Tzu. But it will produce a unique mixed puppy that might be smaller than a Shih Tzu. Mixed breeds are also commonly healthier than purebred dogs. Let’s look at some of the common mixed breeds advertised as teacup Shih Tzus. The Chihuahua is one of the smallest dog breeds in the world. So it is popularly used to shrink already small breeds like the Shih Tzu. The Shichi can weigh anywhere from 5-12 pounds. Their fur can be long like a Shih Tzu or short like a Chihuahua. They are prone to a few health problems but are generally healthier than a purebred Shih Tzu. Their personality might be laid-back and calm, or excitable and reserved. The Bichon Frise is a white, fluffy dog that is similar in size to the Shih Tzu. When combined with the Shih Tzu, it can create gorgeous, smaller puppies. However, the Bichon needs a little more exercise than the Shih Tzu and enjoys short periods on intense activity. Puppies of this mixed breed can be more excitable and hyper than your average Shih Tzu. In many cases, breeders will attempt to make a dog smaller by introducing the dwarfism gene. However, this is not possible in the Shih Tzu because the breed already has the dwarfism gene. This is why the Shih Tzu’s legs are shorter than average and their backs unproportionally long. This gene is also the cause of many of the dog’s health problems. IVDD, a back disease that can cause paralysis, is caused by the dwarfism gene, for example. Because this dog already has the dwarfism gene, breeders cannot re-introduce it in an attempt to make the Shih Tzu smaller. All teacup Shih Tzus are created using one of the other methods. This is a reasonably straightforward way to create a teacup-sized version of a dog breed. When you breed smaller dogs together, they create more miniature puppies. If a breeder is attempting to develop smaller dogs, this makes sense. However, this method comes with a lot of drawbacks. Puppies are usually runts for a reason. Many runts have underlying health problems that have caused them to become smaller than their siblings. Even if a runt was not initially smaller, contracting a disease during puppyhood can stunt their growth and cause them to be smaller when full grown. This is likely why runts are characterized as being more sickly than regular sized puppies. It isn’t that smaller dogs are more prone to getting sick; its that they’re smaller because they are already ill.
Heart problems, infectious diseases, joint deformations, and other disorders can cause a dog to appear as a runt. If two runts are bred together, they can pass these disorders on to their puppies. This can create sick puppies. Is a Teacup Shih Tzu Right for Me? A teacup Shih Tzu can be a good family dog due to their mellow and laid-back personality. However, they are also prone to quite a few health problems. Their disproportionately small legs cause them to suffer from back and joint problems. Intervertebral Disk Disease is relatively common. And their shortened faces can cause brachycephalic problems that make it hard for them to breathe properly. They are also prone to hypothyroidism, epilepsy, renal dysplasia, and hip dysplasia. Because of all these health problems, we recommend looking at other similar breeds before deciding which breed to adopt. The Lhasa Apso is an increasingly popular dog that looks and acts similarly to the Shih Tzu without all the health problems. 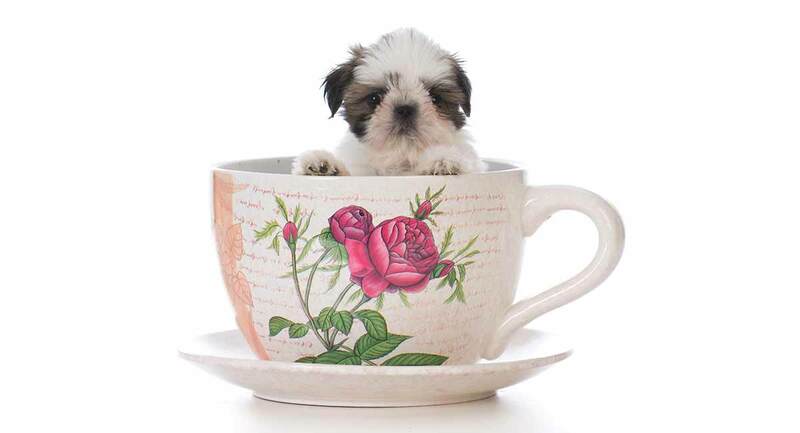 If you’re set on a teacup Shih Tzu, then it is imperative to choose a healthy one. Only adopt puppies from breeders. Breeders often follow ethical breeding practices and produce healthier puppies than puppy mills and pet stores. We recommend choosing a mixed breed instead of a teacup created by another method. While it won’t look or act exactly like a Shih Tzu, mixed breeds are often healthier than their purebred counterparts. You should also ask the breeder about health testing. Many of the disorders Shih Tzus suffer from can be tested for before breeding takes place. Ask about the health of the parents and grandparents. If they’ve passed away, ask what they died from and how long they lived. If at all possible, ask to meet at least one of the parents. This meeting will give you a good idea what your puppy might act like in the future. Do you have a Shih Tzu? Let us know about her in the comments! Nicholas, Frank. “Hybrid vigour in dogs?” The Veterinary Journal. 2016. Breit, S. “Osteological features in pure-bred dogs predisposing to thoracic or lumbar spinal cord compression.” Research in Veterinary Science. 2002. Patterson, DF. “Hereditary congenital heart defects in dogs.” Journal of Small Animal Practice. 1989. Hoppe, A. “Progressive nephropathy due to renal dysplasia in shih tzu dogs in Sweden: A clinical pathological and genetic study.” Journal of Small Animal Practice. 1990.